CLICK HERE FOR THE 2018 SUKKOT SCHEDULE! Sukkot is right around the corner, and we are so lucky that Center City is full of public Sukkot for anyone who wants to visit one. Check out this map to locate the one nearest you! We’re especially excited that this year the Center City Kehillah is building our own community sukkah in Julian Abele Park at S. 22nd Street between Carpenter and Montrose. It will be open to anyone who wants to bring their own food for yom tov (holiday) meals and also for events sponsored by various organizations throughout the holiday. Many thanks to Lori Turner of Music Monkey Jungle for donating the sukkah, to Beverly Socher-Lerner from Makom Community, to Melissa Meyers and Dan Rosenbloom, and to the Friends of Julian Abele Park! If you want to have a meal here and would like access to the tables and chairs, please contact us! Note that we will not be replying to emails Oct. 5-7 and 12-14. Everyone is invited to help build and decorate the sukkah on Sunday, October 1 from 1:00-4:00 pm. Click here for details! Immediately following our sukkah building will be PhilaSing, an interfaith communal song circle. Sukkot begins at sundown. 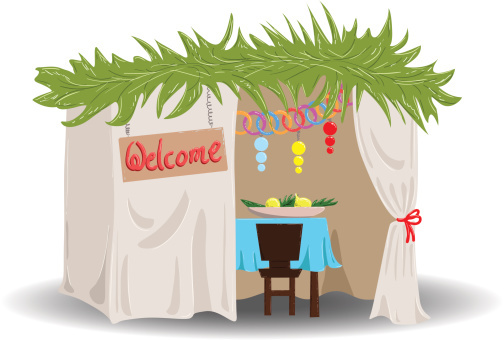 Bring your own food for any meal and join friends and neighbors in the sukkah! Tables and chairs will be available. Please take all trash with you at the end of your meal. Heymish Minyan will be meeting for Kabbalat Shabbat services at 7:00 pm followed by a vegetarian potluck dinner. Email info@heymishphilly.org for details. Minyan Tikvah will be heading to the sukkah for a vegetarian potluck lunch. Timing will be approximately 12:30 pm following Shabbat morning services at BZBI (18th and Spruce). There is also a rain location for lunch. Email info@minyantikvah.org for details. Join Makom Community and jkidphilly for a Family Picnic in the Sukkah from 5:00-7:00 pm. BYO Picnic & blanket and come meet families in the neighborhood. We will get to enjoy the sukkah in Julian Abele park, eat, and relax while kids play in the park, too. Join Moed from 7:00-8:30 pm as we meet in the sukkah to mark the end of Shabbat and welcome the coming week together as a community. There will be a short sukkot learning at 7:00, followed by a musical Havdalah ceremony, snacks and hanging out. Click for more info and to RSVP! All are welcome! Sukkot Yoga will be from 10:00-11:00 am. Join Dr. Deb Glassman and Temple Beth Zion-Beth Israel for a special Sukkot yoga practice outside! Please bring your own mat. BZBI is also hosting a sukkah hop from 12:00-5:00. Stop by the sukkah anytime, and if you’d like to participate in the rest of the event and get a map of other sukkot around Center City, register here. Join the Society Hill Synagogue Young Families group from 4:00-5:00 for songs, stories, and snacks, as well as a little craft project. Our program will be led by a professional educator with years of synagogue-based Jewish education background. Our goal is to help families make traditions and enjoy the community we have built! There is no need to have Jewish knowledge, experience, or be a synagogue member. Our program is geared towards families and caregivers with infants through pre-K kids, but everyone is welcome! More information can be found on http://www.societyhillsynagogue.org/young-families-group/ and by contacting Joanna Hart at joanna.lee.hart@gmail.com. Tribe 12 is hosting Just Roll With It: Sushi Rolling in the Sukkah, a social events for young professionals from 6:30-9:00 pm. Cost is $5, and registration is requested here. Bring your own food and join the Center City Kehillah representatives for dinner from 6:00-7:00 pm. Shemini Atzeret, the holiday for the end of Sukkot, begins at sundown. You’re still welcome to come and eat in the sukkah anytime! Mekom Torah will be meeting for lunch at its Thursday Torah class in the sukkah from 12:00-1:30. Email helen@mekomtorah.org for details. Simchat Torah – if you need help finding a place to celebrate, let us know! Please come by to help us take down the sukkah and pack it up for next year! Exact timing TBD. Let us know if you’re available to help!